Click here (PDF 52KB) for a PDF version of this page. 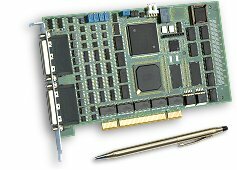 At the heart of all MultiFlex PCI Series motion controllers is a powerful and flexible 64-bit floating-point CPU and high capacity FPGA which can be quickly adapted to a multitude of applications. Not only can users re-assign the default functions of all I/O channels using our software-based I/O Configuration Utility, but the generous processing capacity, memory and I/O available on-board also allows PMC to add significant new features and performance enhancements to meet the unique needs of specialized OEM applications and deliver highly optimised solutions at a fraction of the cost of competing controllers. * Custom configurations are available with a 1-2 week initial lead-time to qualified OEM's.